ROME-- An expert on Italian travel for Black women, BlackGirlTravel.com Founder Fleace Weaver is building on years of intimate knowledge of the market with brand-new and expanded tour offerings for 2013. From the multi-generational Divas & Daughters to an enhanced Bella BootCamp that offers a weight-loss program along with stunning scenery, these tours take full advantage of Weaver's move to Rome in mid-October, allowing her to become even more of an African-American expert on Italian culture. These exciting tour concepts complement the ever-popular Bella Italia and Roman Holiday, BlackGirlTravel.com's annual whirlwind signature tours of Italy that takes dozens of African-American Bellas to Rome, Florence, Venice, Naples, and the dazzling Amalfi Coast each year. "When my girls visit Italy, there's an intimate connection" says Weaver, a former fashion model and founder of the L.A. lifestyles site BlackWeekly.com. "Because I am so enthusiastic and passionate about the country, my travelers really connect to Italy through me and the unique personal experiences that are created just for them". Considered the Pied Piper of African-American female travel, Weaver manages her L.A.-based company and staff from her new home in Rome. Living on the Italian peninsula seven days a week, 24 hours a day, allows her to strategically expand BlackGirlTravel.com's offerings and positions me to be an even greater resource on Italian travel for black women. Among the new experiences introduced for 2013 is Divas & Daughters. Weaver has created a fascinating new tour that allows Black women to give the lifelong gift of TRAVEL, rather than things, to young African-American girls in their lives. "We want to encourage these future FlyGirls to get that first stamp in their passports and international flight miles," says Weaver. 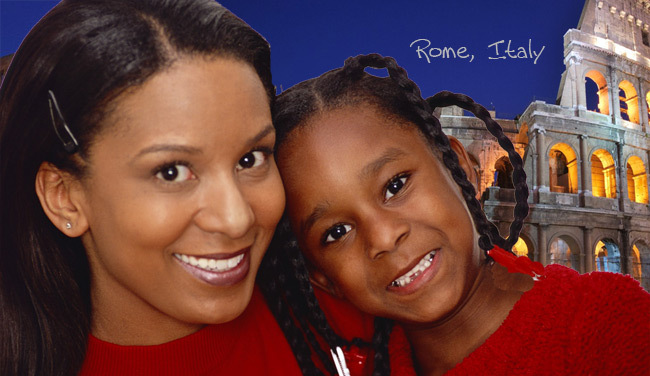 The six-day Divas & Daughters tour will make its first trip to Rome, Florence, and Venice in August 2013, allowing adult Divas to introduce girls between ages 8 and 17 to the splendor of Italy and the joys of international travel. "That's why we're doing Divas & Daughters, to make sure it is intergenerational and passed down," Weaver says. "As these girls grow up, they'll see travel as an important part of their lives." Scheduled for Aug. 2-8 and Aug. 9-15, these tours will allow these young travelers to bond with each other, visit world-class sights and build lifetime memories in Italy, a country that passionately celebrates "family" every day. "This is a way for mothers and daughters to get away to spend quality time together without the day-to-day distractions of daily life," says Weaver, who reports that some mothers are bringing more than one daughter along for this once-in-a-lifetime trip. Diva grandmothers and aunts also are bringing special little girls in their lives. And for Divas wishing to travel with grown-up daughters, BlackGirlTravel.com will offer an all-adult Divas & Daughters tour over Mother's Day 2013. The New Year also brings with it an expanded Bella BootCamp, which made its debut in September 2012. After repeatedly hearing that Bella Italia participants were pleasantly surprised at shedding five to 10 pounds during their whirlwind Italian vacations just by keeping up with Weaver's nonstop pace and living life the way the Italians do? Weaver created Bella BootCamp for women who purposely wanted to lose weight while exploring the treasure of Rome. After all, African-American women are much more likely than women of other ethnicities to suffer from weight-related conditions such as diabetes, high blood pressure and obesity. And with 2013 around the corner and many women vowing to launch new weight-loss and healthy-living routines, Bella BootCamp fits wonderfully into the globe-trotting Black woman's lifestyle and travel resolutions for the New Year. A hit from the start, Bella BootCamp's 10-day exercise in "cultural fitness" brought three curvaceous women wanting to shed a few pounds to the streets of Rome and despite the lures of Italian cuisine and wine, they lost weight! A tour that combines the always-on-the-go pace of Bella Italia and a weight-loss program created with fitness professionals, Bella BootCamp uses the Eternal City itself as its playground and outdoor gym. Offering everything from morning yoga and meditation to walking and bicycling to hearty climbs up the famed Spanish Steps, Bella BootCamp bills itself as "the tour where you can bring home a better body as a souvenir." Best of all, participants learn about the ongoing rewards of a healthy Mediterranean diet and lifestyle. Bella BootCamp is scheduled for May and September. Other excursions for 2013 include destination tours to South Africa in January (with an arrival on Dr. Martin Luther King Jr.'s birthday); a combined Egypt, Dubai and Abu Dhabi getaway in February; a spirited 11-day May in Paris tour that also makes stops along the French Riviera; and Roman Holiday an intimate, 13-day trip for six to seven women to the Eternal City and Barcelona during the sultry summer days of July. Of course, there is the signature tour that started it all the ever-popular Bella Italia in September. 2013 also will see BlackGirlTravel.com debut excursions to Italian border countries like Croatia and will offer private "Concierge Tours" for family or friends groups of six or more. Weaver plans to introduce culinary and other cultural trips to regions off the beaten path to many American travelers, including picturesque Le Marche on Italy's eastern coast and ancient Puglia, located on the heel of the Italian boot shape country. Of course, each will offer a unique BlackGirlTravel.com spin and continue Weaver's focus on "empowerment through exploration."? Says Weaver, whose grandfather came from Bari, the lively commercial port city in the Puglia region: "There is no place in the world like Italy!" Please support BlackGirlTravel.com efforts in empower Black women by forwarding this stroy to at least three other African-American females. BlackGirlTravel.com is an upscale travel club created by and for extraordinary, fun-loving Black women. Its goal is simple: to expose Black women to the beauty of the world and the world to the beauty of Black women. BlackGirlTravel.com creates unique, customized tours and meeting programs for groups and individuals. These global excursions are designed for young-at-heart, well-heeled urbanites interested in exploring new lands while indulging in international cuisine, "retail therapy," and exciting nightlife. There are no cookie-cutter itineraries here, as each tour is custom-designed for the group and its participants. Everyone from seasoned globe-trotting travelers to international travel virgins seeking the security of a group will feel at home on the road with BlackGirlTravel.com, whose website is a one-stop resource for travel-related information specifically targeted to Black women.